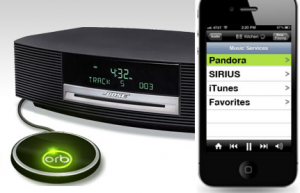 The Orb works with Windows or Mac and is controlled by an Android smartphone, iPhone, iPad, or iPod Touch. An Orb user we talked to had teenagers who use it to share their music collections. There’s an Orb in every bedroom, attached to that room’s stereo. They can browse each other’s music collections and play what they want on their own stereo. The next version of the Orb software will have privacy controls in case you don’t want to share with everyone on your home network. We had trouble connecting the Orb at first, but we complained and the company issued a software update that made it smooth sailing. We connected the egg-shaped Orb to our stereo and used an iPad to scroll through Internet radio stations and audio files stored on our PC. Since what it’s doing is broadcasting audio files from your computer to a stereo system, you are not confined to music. We played free lectures from iTunes U, and as some shows from National Public Radio’s “Wait, Wait, Don’t Tell Me.” Using an iPad or iPhone as a controller, we skipped around, choosing different items from our playlist. For more info on the Orb, go to orb.com.